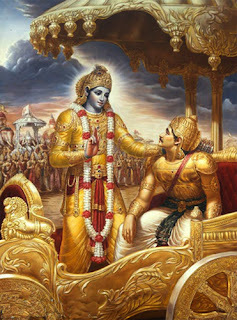 Krishna gives spiritual instructions to Arjuna on the battlefield of Kurukshetra. Krishna, according to various Hindu traditions, is the eighth avatar of Vishnu. In the Bhagavad Gita (e.g., 10.15 and 15.19), he is seen as the Supreme Person and the highest God. Thus, according to traditions such as Gaudiya Vaishnavism, he is the origin of all other incarnations. Krishna and the stories associated with him appear across the spectrum of Hindu philosophical and theological traditions. Though they sometimes differ in details reflecting the concerns of a particular tradition, some core features are shared by all. These include a divine incarnation, a pastoral childhood and youth, and life as a heroic warrior and teacher. The immense popularity of Krishna in India also meant that various non-Hindu religions that originated in India had their own versions of him. Arjuna or Arjun (arjuna) is one of the heroes of the Hindu epic Mahābhārata, whose name means 'bright', 'shining', 'white' or 'silver' (cf. Latin argentum). Arjuna was such a peerless archer that he is often referred to as Jishnu - the undefeatable. The third of the five Pandava brothers, Arjuna was one of the children borne by Kunti, the first wife of Pandu. Arjuna is considered to be an incarnation of Nara, the younger brother of Narayana. He is sometimes referred to as the 'fourth Krishna' of the Mahabharata.